The long, eel-like fish drinking the blood of this lake trout is one of nearly fifty species of lampreys, a group of jawless fishes found in temperate rivers and coastal seas. Some species live in fresh water for their entire lives. Others, like the sea lamprey (Petromyzon marinus) shown here, are anadromous. That is, they are hatched and grow in fresh water, migrate to the ocean to mature, and then return to fresh water to spawn. Lamprey eggs hatch into small larvae, known as ammocoetes, which are not predators at all; they lack the sucker mouths of the adults, and feed by producing strands of mucus and trapping food particles. The ammocoetes stage may last up to seven years before its metamorphosis into an adult. Adult lampreys live for a year or two before spawning, and then die soon afterwards. The adults bear seven separate gill openings and have an internal skeleton of cartilage. Unlike hagfishes, with which they were once classified, lampreys have a complete braincase and rudimentary true vertebrae. Uniquely among living vertebrates, lampreys also have a single "nostril" on the dorsal side of the head -- a feature they share with various fossil jawless fish, which had a similar opening. Lampreys have a round, suckerlike jawless mouth filled with rows of horny teeth, and a rasplike "tongue." (See picture at right) An internal ring of cartilage supports the rim of the mouth. Although lampreys sometimes prey on small invertebrates, they are better known as predators on fish. Fastening on to living fish, lampreys rasp into the flesh and feed on the body fluids. A fish attacked by lampreys may be severely weakened or even killed. There have always been native freshwater lampreys in North American waters. 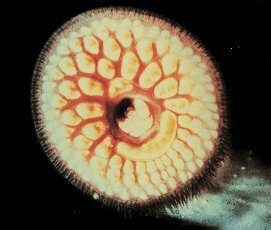 But since 1835, the sea lamprey has been spreading through manmade canals into the Great Lakes of northeastern North America; it is now found in all five lakes and in several of the rivers that flow into them. In the 1940s and 1950s, the sea lamprey caused serious damage to the fisheries of the Great Lakes. It is now the subject of control efforts by U.S. and Canadian governmental agencies, and the Great Lakes fisheries have recovered. Because they lack mineralized tissues such as bone, lampreys are rare as fossils, and their early evolutionary history is still poorly known. Only three definite lamprey species are known from the fossil record, all from the Pennsylvanian (Late Carboniferous) of northeastern Illinois. These are very similar to living lampreys, and suggest that the group has not changed very much in the past 300 million years. A few other unarmored, jawless fossil fishes (traditionally classified in the Anaspida) from elsewhere in the world are now thought by some to be members of the Petromyzontiformes, or at least close relatives. The earliest likely candidate is the early Silurian fossil Jamoytius, which may have had a cartilage ring supporting a round mouth, like living lampreys. The Great Lakes Fishery Commission maintains informative pages on lampreys and lamprey control programs in the Great Lakes. The photographs of live lampreys on this page are courtesy of the Great Lakes Fishery Commission. Also check out this factsheet on the sea lamprey, brought to you by the Florida Caribbean Science Center. The lamprey page at the Tree of Life has a great deal of information on the anatomy and biology of lampreys. A list of lamprey-related WWW resources is available as part of the comprehensive Ichthyology Web Resources site. Or click here for a recipe.